When Technology Freezes – Could I Be the Cause? I have decided – a little late I admit – but better late than never right? – to take some time throughout January and document my daily experiences and thoughts. A bit like a diary, or a journal, but public. I’m doing it because of the thought I caught running through my head on the morning of January 1st which I wrote about here. I was a little appalled at how easily and quickly I had forgotten to respect and enjoy the blessings of my life and was falling into ‘Not enough’ and ‘Not fair!’ mode. Negative thoughts are the root of all evil in my opinion and I have spent the last twenty years learning how to recognise, change and adapt my life style to overcome this tendency in myself. I am also starting a daily art project, a word a day to document my journey through 2014. Inspired entirely by following a link my blogging pal AJ put up on her blog yesterday. It will be a challenge for sanguine artist-me to stick to something like this, so I am not aiming high – just one word a day, playing with colour, shape and pattern. I’m stating it in my blog so that you will keep me to it – I hope – that’s what friends are for, right? Well, even if you don’t, it’s out there and, being of the Virgo persuasion, I shall feel the need to keep my word to myself and do my best to achieve my goal. Here is the first installment of my January journal – it covers events that began prior to Christmas up to yesterday. Just before Christmas my fridge, barely four years old, decided it no longer wanted to just be a cooler and overnight became a grown-up freezer. Being a gal with more dash than cash, and more than a dash of Scarlett O’Hara in me, I thought ‘I’ll think about this tomorrow’ and, being a gal with a positive set of mind I also hoped it might get tired of maintaining such a cold life style and would soon revert back to its original and proper state of being. I tossed out two containers containing three trays of freshly grown alfalfa sprouts – frozen and limp – the vegetable drawer full of frozen lettuce, tomatoes, capsicums, carrots and other life affirming fresh foodstuffs – all hard as rocks and speckled with enchanting ice crystals. Tray after tray of previously good edibles froze solid overnight and became sludgy waste as they unfroze on the counter-top. I have enjoyed frozen yoghurt on my breakfast cereal as a summer delight accompanied by frozen strawberries and frozen blueberries. I find if I wait long enough – about an hour – between the making of breakfast and the eating of it, there will be some softening of said ice crystals and the meal becomes somewhat more palatable….. It makes for a lovely, slow start to the day. This morning, as I chipped off some frozen milk to add to my first coffee of the day, I realised the freezing rate is increasing rather than abating – a bit like the weather in Canada as I understand it from Linne and Boomdee’s blogs. Of course here in the Summery Southern Hemisphere, this is exactly the time of year when the entire country closes down for Christmas, followed by New Year, followed by Summer Holidays There will be nary a tradesman around who will not charge double rates and take six weeks to get back to you. I curse my naive belief that technology has an inbuilt ability to nurse itself back to health. But then the unthinkable happens – the freezing, it appears, is contagious! Esmeralda decides to join in and freezes too. She doesn’t drip ice everywhere, just plays possum, refuses to move and refuses to shut down so I can restart her. 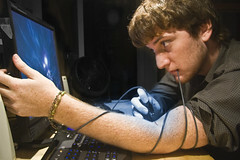 I do all the things we have all so painstakingly learned to do with our PC’s over the last decade. I hit ‘control-alt-delete’ once, twice, three times. Nothing. I push the power button – nothing. I turn her over to extract the battery, it’s a non-extractable battery! I pull out the power cord and wait for the battery to go flat. She sits and looks at me with her pretty blue desktop screen and refuses to budge. Half an hour later she turns herself off, then on again. I open the desktop with a sigh of relief. She freezes. For three days, my shiny new laptop froze three times in succession every morning and every three hours thereafter, refusing to move until I unplugged her and waited for the battery to go a little flat when she would turn herself on and pretend to be good for a bit. The fridge is a freezer, the laptop freezes what’s going on? YD looked at me thoughtfully and slowly nodded her head. Sometimes you just get someplace odd in your soul life and affect the running of things that normally just run properly and do what they are supposed to do. Its a sign….. I’m freezing everything! It’s always the mother’s fault! “Ahhh, crap!” I said ………..I don’t know what to do about that at the moment . So yesterday morning Esmeralda found herself stuffed into a nicely padded and very comfortable computer bag with all her cords and bits and was briskly marched back to the shop. Where not one, but two Geeks – or Nerds – I’m never sure which is which – set about trying to see what the issue was. Ignoring my offer of cords and bits she was set up on the desk, turned on and ran splendidly. I talked them through the things I would be doing when she froze and the Head Geek pushed the right buttons, opening and closing programmes, zipping through the internet and Esmeralda sparkled along happily with them. Just as the two bemused geeks were trying to find a polite way of telling me there appeared to be nothing wrong with my bright and shiny and ever so clever new laptop, YD wandered up. The geeks, also looking bemused, but ever so polite, agreed that was worth a shot. Out came the cords and Esmeralda was plugged in, turned back on – and froze! I jumped up and down and clapped my hands. I patted Esmeralda fondly “Good girl!” I said. The Geeks smiled painfully at me. ‘How did you know?” they clamoured to YD – I could see she had just been elevated from eye candy to extremely smart Geek/Nerd Heroine status and at any minute they were going to do the “I’m not worthy” bow to her and possibly hoist her on their shoulders and parade around Harvey Normans proclaiming her Geeky Goddess Incredibleness. YD made a hasty escape back into the furniture department where she had found a wonderful lamp and an amazing chair neither of which she needs, has room for or can afford…. but which sure were pretty! I surprised them by being prepared for such an eventuality. Will over at Technoblog had already prepared me for just this moment. I’d done the backup of all the files on my trusty USB and they were free to do whatever they needed to do. I could see that momentarily I too had been elevated from ‘Horrendously Non-Geek’ to ‘Almost There’. I felt quite proud – thanks Will! ‘Like you’ve never frozen!’ I say in a stern voice and Flat and Shiny becomes quiet. Oh, yes we remember those days – she didn’t just freeze, she crashed and took everything down with her…. I’m looking forward to Esmeralda’s return. I’m hoping her issues with her cord have been resolved and that the damage is not long lasting…… I am hoping we can find an amicable way for them to co-exist together that will not involve freezing, crashing, slowing or any of the other ills PC’s are vulnerable to. Next I’m going to see if there is a cure for my wayward fridge – YD is convinced it’s ‘just a sensor’ whatever that means……….. but she is to be listened to in these technology issues apparently. And I’m certainly going into therapy immediately to attend to my issues around coldness! What an interesting year it is already! And I haven’t even begun my year long art project or my daily yoga practise yet….. Must start, must start, must start! Have you entered the Give-Away yet? Three days to go! This entry was posted in Daily Life and tagged daily yoga practise, diary, Freezing, Geek, journal, laptop freezing, positive thinking, putting off until tomorrow, Scarlett O'Hara, tech issues, technology, what does a fridge become when it grows up?, year long art project by thecontentedcrafter. Bookmark the permalink. Too funny! But does Esmeralda behave beautifully now? She does – there hasn’t been [touching wood] a moment of trouble since! Oh my. I laughed, smiled and mostly commiserated. Darn electronics. What a great story teller you are. I felt like I was there in the store with you. Our fridge went on the fritz after one year, and during one of the worst heatwaves we’ve ever had. It couldn’t be repaired, and we waited a month to get the new one. After buying blocks of dry ice every other day for two weeks, and eating out more than we cared too, we finally bought a mini-fridge (popular with dorm students) and got by with that till the new one came along. Happy New Year to you too,. You know, I’ve never thought of Colorado being a place where it got cold. In all the cowboy movies I saw it it featured in, it was always summer……… do keep warm! It looks like your technology (no doubt all built in the Northern Hemisphere) has gone out in sympathy with its Northern Clime cousins. We found that our fridge (all fridge…no freezer) was freezing and icing up (go figure!) so we checked out the sensor and found that it was blocked. After poking it a bit we must have fixed it as it now works well…crisis and new iceage In Tasmania averted! Good that you picked up Esmerelda’s problems before they escalated (and you had a HUGE amount to back up). Probably a faulty wire in the cord or something. Glad to see someone else doing something new each day and counting their blessings. After starting the New Year with a sinus headache from hades it could only really get better from there :). Hugs from Sidmouth and heres to creative genius. Steve and I are painting as well…our deck. So far I have managed to turn out 2 amazing portraits. narf7 as Kermit would be worth a look! I wish you were here and could find my sensor for me – I’ve looked but have no idea where it lives. I have to get it fixed – who knew it was so challenging living without a fridge? Really, how did those early settler women manage?? As my belief that the fridge could right itself has turned out to be completely off the wall I shall just have to bite the bullet 🙂 All will be just fine! I’m going to try threatening it a) being thrown out the window – I don’t have a deck – and if that doesn’t work b) threatening it with a visit from you and that will surely do the trick! But if it doesn’t I’ve got plan c) which is a nice long list of refrigerator service people to call – whoever is in the office gets the job! I see I am speaking to a convert when I am talking about possums. When we first moved here I actually cut up peanut butter sandwiches, put out little chocolate chip biscuits and cut up fruit for them. I would lay it out on the deck rail each night and would smile when I saw them coming for it as I figured (stupidly as it would end up) that by feeding them I would befriend them and they would leave my potted babies alone. Took me all of a month to realise that the fat thieving sods were scoffing all of the food on the rail, eating my potted plants and STILL scoffing the tender shoots off everything out in the garden. I think they were having rave parties at my expense! Nothing like a possum fight to keep you up at night. You can get used to the screaming, but it’s hard to find a pillow big enough to put over your head when Earl joins in and goes outside to bark at them…sigh. Living in the country certainly makes you rethink your approach to nature. You stop being a sooky la-la about it and start nailing it! I have gone from “oh so CUTE” to “quick Steve, hand me a rock!” and I am a vegan! I think living in the bush wrings the soppiness out of you. It also brings out the genius in you… sort of like living on the edge of civilisation and having to reinvent the wheel on a daily basis…keeps you keen because you have been treated mean (sorry to bastardise and mix my metaphors 😉 ). I admit there were a few glitches in the plan – but I saw the ending only – a sea full of swimming possums heading back to their homeland and beaches full of cheering people, happy baby birds, flourishing rain forests and blooming plants! There would be fireworks and balloons and cries of ‘Huzzah!’ and ‘God Speed!’………. Alas, no one took up my plan and DOC reverted to laying poison in heavily infested areas – taking out any other ground foraging bird life and innocently walking dogs at the same time. Now they lay the poison in special possum friendly traps and keep other wildlife safe. This is not the end of my possum stories though – one tried to kill my YD once – ran in front of her car on the motorway, she swerved to avoid it [‘Why?’ I heard myself ask ‘You raised me to do no harm’ she said. ‘Damn!’ I said]] and rolled her car down a bank! Car was a write-off, luckily she was shaken but not stirred! Sounds to me like possums have an agenda! I have to say, I think I have found the perfect solution to possums. “The Earl”. I came out on the deck about a month ago at 2am when it sounded like some Alien creature was trying to break into the loungeroom door (that should tell you how sleep befuddled I was…alien creature + trying to break in + me going to check? MADNESS!) to see Earl with a large and most furious possum in his mouth thrashing it around and bouncing it off the deck timbers, the railings and anything else he could whack it on. His joy turned to horror when he saw me peering myopically through the upright blinds and he dropped his new toy like a hot cake as he isn’t usually allowed to slaughter with impunity (Much like YD, we are trying (vainly it would seem) to educate Earl to “first do no harm”) and this time it bit us on the bum! I think I love Earl! And I have to say – your plan has merit! Please table asap. Pauline, you are a master story teller. I just love how you took this experience and turned into a piece that have your readers engrossed from beginning to end. I love your sense of humor- your lovely Esmeralda will be as industrious as ever soon. About the fridge, I hope that you get someone out to fix it who won’t charge you and arm and a leg. I love the idea of your word a day project. I’m rooting for you! Keep on rooting – there are still 360 days to go ………. Why does everything conk out at the same time? Drats, your brand new computer and you’re having fun and games, that’s the pits. Maybe they should just give you a new one? We had a fridge that did that once, it turned out to be the compressor. But it was almost cheaper to buy a new one. Exciting endeavour you’re taking on, I’m excited to see what you whip up. All computer issues are now resolved………. All together now: Happy dance, happy dance, happy dance! Typical me . . . write a long response and not say what I first intended to say . . .
Love your jounalling idea and the one word artproject idea. May I steal a couple of leaves from your book? I have so many untouched journals (too lovely to ‘spoil’ by writing in them). The only one I really filled up (1.5, actually) was “The Artist’s Way Workbook”. I did really well with those! Although I’m the last person to give advice in that area – there are at least 6 books sitting on my shelf with a small percentage of usable pages actually used – which is why I like to make up my own books now. You make me laugh at the weirdest things, tragical stuff really . . . but I DID figure out what your real problem is . . . remember how they used to say, “Cold hands, warm heart”? Well, your heart is too darn big! So . . . on the one (cold) hand you have a freezing fridge; on the other (cold) hand you have a freezing laptop. Oh – giggle! You do say the nicest things! I’m glad you are following the boys – they know stuff, just need to be encouraged to share it I think…… I am very pleased to report that Esmeralda has been home for 48 hours and has not frozen once! She is all sparkly and twinkly and super efficient, just as she was meant to be. I am so grateful to the super-geeks! The fridge however, is another story. Hopefully that can be sorted tomorrow. Your frig is freezing … your computer is freezing …. 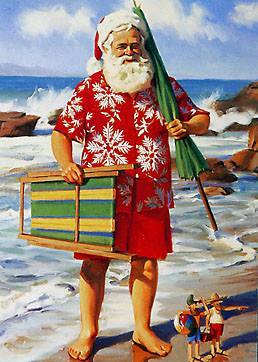 I’m freezing as my area is getting a fierce blast of winter chill, … .and now I’m seeing a picture of Santa in summer attire. Oh the joys of our hemisphere’s being flipped. It’s great isn’t it – really widens our world view! I like the sounding of widening world view. lol..your post was great! I was with you through the entire experience. I don’t have any “eye candy” at my house to help me with the geek squad-tee hee…My youngest comes home from graduate school ( he is in physics), and attempts to educate me in some basic computer programming! lol…I learn some , but once he leaves, I am back logging into You Tube to learn some basic programming skills that I did not get in high school or college..since I am from the “AGE” of “punch cards”..HELP!! !…I was into the arts back in college when my other friends were carrying around those stacks of punch cards! Well, now I am having to learn all this stuff…and at times it does make sense….just not always everyday-lol! :-) great story! I know they can help, but wouldn’t be so much easier if we were “wired” from day one for this techie stuff! I had to talk to a guy on the phone once about something on a domain name etc…it was funny when he mentioned the symbol “pound sign” is known as “hash tag” …lol…now I hear it all the time…hash tag this /that..lol…it all just reinvents itself! You are so calm in the face of calamity (which is what losing a laptop would be)! Despite the subject of freezing computers and refrigerators, I enjoyed the post because of your writing style. Nicely done! Keeping my fingers crossed that all problems are solved! All will be well Laurie – eventually – sometime – whenever …. 🙂 And thank you, I’m so pleased you enjoyed the post – I often try to remember when I’m in the middle of something that makes me want to tear my hair out or have a fantastic tantrum – that the whole thing will make a great story some day! Thank you Gretchen – entirely inspired by your amazing creation last year! A great post 🙂 However I am sneaking a peek at work and no time to look at your links so will do so later. I have been trying Zentangle / Doodling, and loving that…I can just pick up and carry on with whatever takes my fancy that day. Such a good creative experience. I will reread this later and check out your links *whispers* “We are not actually allowed to use work computers for personal Pauline”. Naughty Wendy! I hope you didn’t get caught breaking the rules…… and you are doodling!! Isn’t it fun? I get lots of ideas from doodling – it’s amazing what appears as you keep at it! No, didn’t get caught, I was there on my own but then felt guilty 🙂 I have enjoyed flicking through Gretchen’s blog just now 🙂 Yes, I am really enjoying the doodling and just wandering through it and seeing what eventuates. The power supply, I got mixed up, please edit this in, thanks in advance! I HAVE AN IDEA!!!!!! Since it only freezes when the power goes out, it could be a problem with the battery/connecters. It could be unable to power the hardrive! It’s a good idea if the OS isn’t the problem. I know by the time of posting the super-amazing-computer geeks,who even sometimes put me in a spin, would of told you. It’s an interesting idea, thanks my freezing computer (now called Spectre) for giving me the idea! In other words, the power isn’t reaching X part of the computer – causing it to fail. This…could be bad. However, hardware failure is unlikely. Plus, you’d be covered! Bit sorry for “over commenting” but I felt I had to says this… I appogise in advance. Good luck with your project, I wish you all the best. A senor is a little thing that tells the fridge X thing it moniters. A conputer’s sence of feeling, if that makes any sence. All YD was saying is that a the thing can’t tell what the temp is. Therefore, it’s giving false infomation. I’m writing on my restored computer and so far so good. Thanks you for all your helpful suggestions and explanations etc. I appreciate it all and love your willingness to help out! It’s also nice to see you touch those emotions a bit – not all geek/nerd then! 🙂 Have a good weekend Will! I think a post on restore is a very good idea…… may I suggest you do it in three installments – start with ‘Why you might need to do a restore’ followed by ‘what to do before you restore’ followed by walking us through the restore process step by step……….. I am so aware that when you tech type guys are talking to people like me, you make assumptions about how much I know. KISS – keep it stupidly simple! 🙂 Assume nothing – explain it to a three year old! The other thing is if you are running Windows 8, teach that. If you do it clearly and slowly, you will attract plenty of followers. Put content into your blog rather than just lists of product popularity etc…… again, just a thought and only my opinion. Good Luck!! I’ve just read it Tom – and he has done SO well!! 🙂 I’m jumping up and down and clapping my hands!! I’m glad to hear that. He has done very well. We are thinking of doing some tutorials soon. Will is very good at writing things like that. I am very happy about the tutorials 🙂 You guys are great! Thank you very much! Your blog is good as well. I wish I could write long posts like this one. I really enjoyed reading it. It’s ok. I’ve tried following advice on writing long posts before and I’m still not very good at it. This post was so awesome! I relate to it so much and I’m thrilled to see you making posts like this, you wrote a great piece. Keep up the great writing!